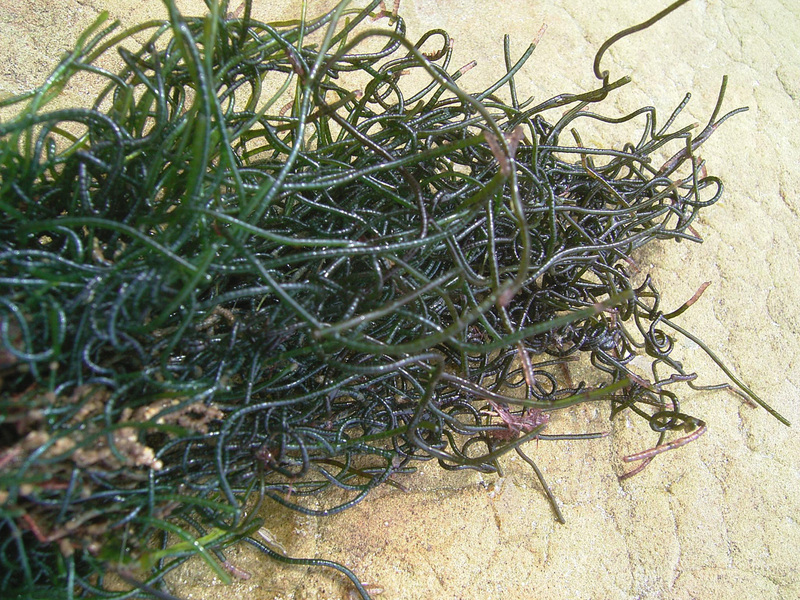 Plants dark green, attached, forming entangled cylindrical filaments, stiff and coiled towards the base. Basal cell curved, thickening from ca 350 µm near rhizoidal attachment to ca 750 µm at distal end. 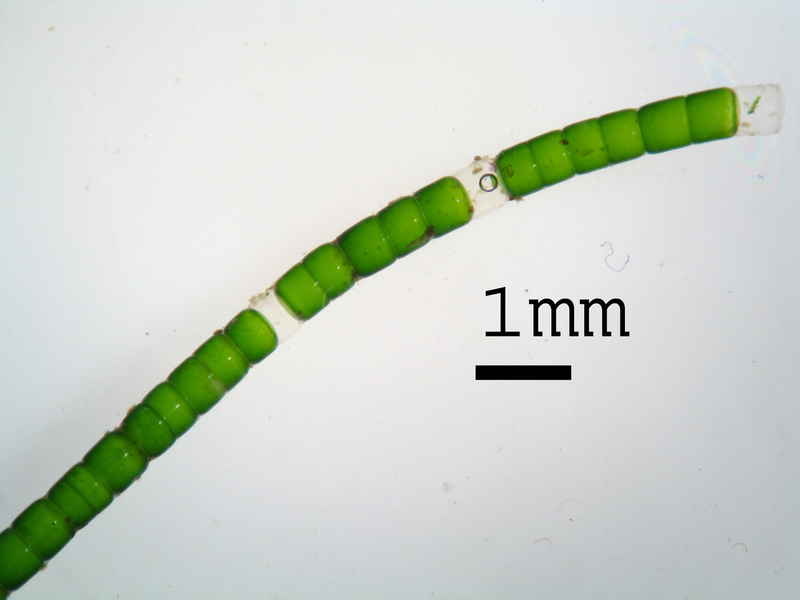 Cells visible to the naked eye, 400-600 µm in diameter but often increasing to more than 1000 µm at the apex of the thallus, about as long as broad proximally but length/width ratio in some specimens increasing to up to 1:2 near apex. Reproductive structures not seen. Recorded from Goukamma to Cape Vidal (29-56). Usually attached to and entangled with other seaweeds in the eulittoral zone. World distribution: recorded from scattered localities in temperate and tropical seas (Guiry & Guiry 2012). Type locality: Chiba Prefecture, Japan (Silva et al. 1996). Note: Leliaert et al. (2001) first recorded this species from South Africa, and provide further information on local records. Guiry, M.D. & Guiry, G.M. 2012. AlgaeBase. World-wide electronic publication, National University of Ireland, Galway. http://www.algaebase.org; searched July 2013. Leliaert, F. De Clerck, O., Bolton J.J. & Coppejans, E. 2001. 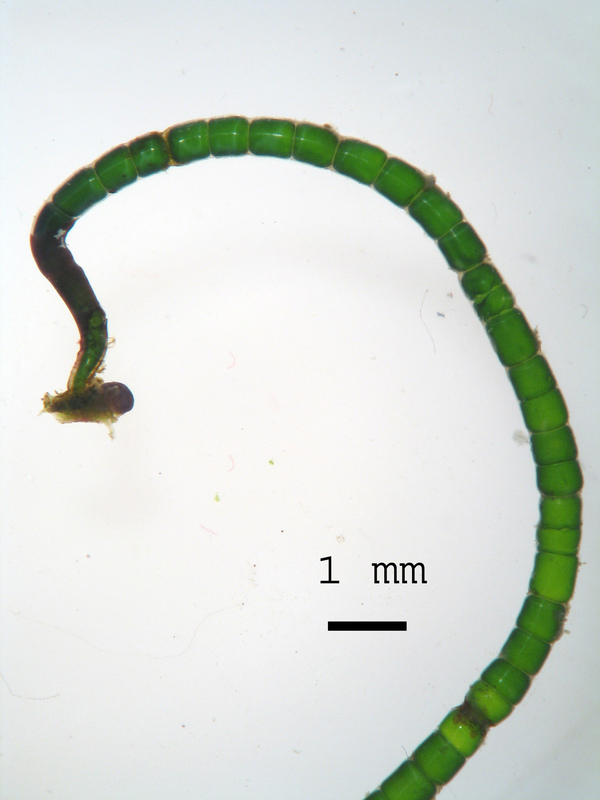 New records of the Chlorophyta from South Africa, with the emphasis on the marine benthic flora of KwaZulu-Natal. South African Journal of Botany 67: 450-459. Okamura, K. (1903). Contents of the "Algae Japonicae Exsiccatae" Fasciculus II. Botanical Magazine, Tokyo 17: 129-132.